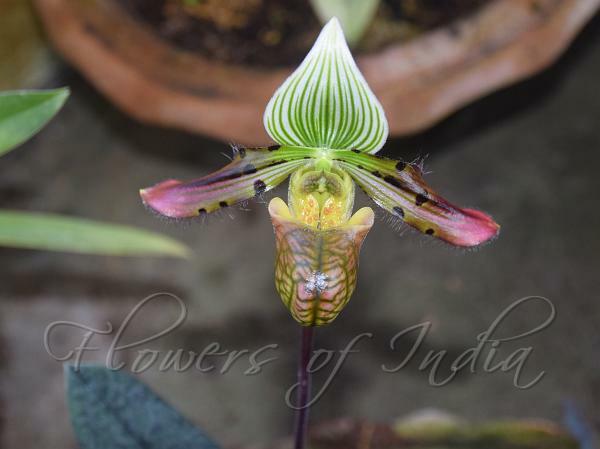 Charming Slipper Orchid is a medium sized, cool growing, shade loving terrestrial orchid with narrowly elliptic, mottled bluish and lighter green leaves, which are purple beneath. The plant blooms in the late winter and spring on an erect, branch-end inflorescence, 12 cm long, deep purple, with a single flower, with a elliptic-lanceshaped floral bract. Flower is 7-8 cm in diameter, dorsal sepal and synsepal white with green veins; petals yellow-whitish with green veins, flushed with purple in apical half, with a few large maroon warts mainly in basal half; lip and staminode yellowish, slightly tinged with purple-red and distinctly veined with green. Dorsal sepal is broadly ovate or ovate-heart-shaped, 2.7-3 x 2.1-2.3 cm, fringed with hairs, tapering at tip; synsepal ovate, 2.3-3.6 x 1.4-1.6 cm, fringed with hairs, pointed at tip. Petals are nearly oblong-inverted-lanceshaped, 3.5-4 x 1.2-1.4 cm, margin wavy in apical half, long fringed with hairs, pointed or blunt at tip. Lip is helmet-shaped, 3.3-4.2 cm, verrucose on lateral lobes; pouch 2.2-2.4 x 2-2.8 cm, outside usually minutely papillate-finely velvet-hairy. Staminode kidney-shaped-obheart-shaped, 6-7 x 9-13 mm, finely velvet-hairy, with a broad sinus and a broad mucro at tip. 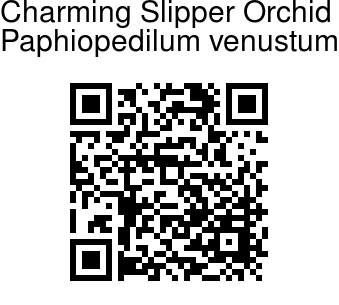 Charming Slipper Orchid is found at the base of cliffs in humus or in dense undergrowth of bamboo thickets often near streams, as well as in the crotch of trees, in NE India, NE Bangladesh, the eastern Himalayas, Bhutan, Nepal and Yunnan China at elevations of 1000-1500 m. Flowering: January-March.